Every industry that sells products in large quantities must contend with the challenge of moving products from one place to another. Air conveyors are just one example of the many methods employed for this purpose. Within primary production facilities, the constituent parts of a manufactured product must be brought into contact with each other somehow. While in some cases it may be cost-effective for materials to be retrieved manually by workers, in many other cases, especially in large scale manufacturing operations, mechanized materials handling equipment is much more efficient. Assembly lines, packaging lines, and other automated manufacturing processes would be impossible without conveyor systems. Pneumatic conveyor systems are widely used conveyor configurations. They can be used for the bulk handling of food, powders, and many other materials in large quantities. Beverage processing, plastics fabrication, pharmaceutical products development, watercraft and aircraft manufacturing, powder coating services, textile production, glassworking, mining, and many other industries make extensive use of conveyor systems. Air conveyors are different from mechanical conveyors, which use conveyor belts and vibrating plates to move objects. While conveyors are a good choice for some operations, air conveyors offer kinds of movement that are not possible with mechanical conveyors. There are many different types of air conveyors. Two of those varieties are dilute phase and dense phase conveyors. Dense phase conveyors move objects with compressed air and are used for conveying mainly heavier materials such as metals and high-density plastics. As a result, these convey at a slower rate than dilute phase conveyors, which convey by diluting and suspending products with positively or negatively pressurized air. 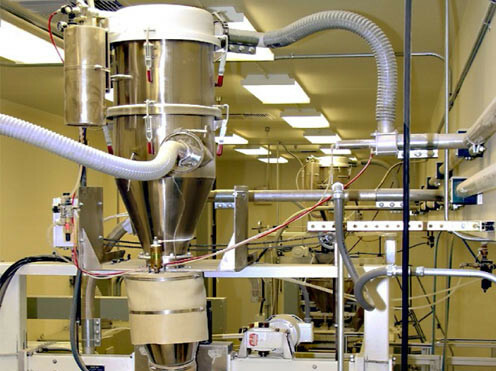 Vacuum conveying can be used to convey smaller, lighter materials like powders and low-density plastics. Some air conveyors are named for their specific duties, such as the bulk handling conveyor, the abrasive materials conveyor, and the food handling conveyor. Air conveying is a cost-effective, reliable, and quick method for transporting many different materials. Some of these materials include powders, grains, soils, sands, pills, pellets, tablets, rocks, metals, carbon black, coal, gravel, chemicals, textiles, food, plastics, wood chips, toxic waste, and asbestos. Air conveyors are highly reliable and easy to maintain, both of which features make them attractive options for many operations. Air Conveyors Air conveyors, also known as pneumatic conveyors, are materials handling machines that use pressurized air to move objects.